Over tall gin and tonics in the afternoon at the Wedgewood Grill Lounge, Stuart MacDonald slowly relayed his story. He is trying to manage the elusive balance between a creative and conventional life. 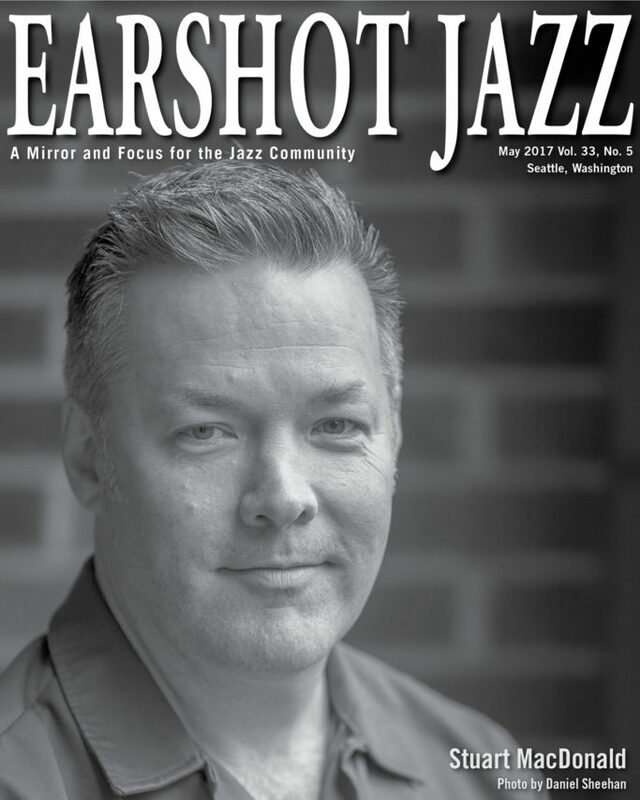 His current activity centers around a two year Master of Music in Jazz Studies and Improvised Music degree program at the University of Washington. As a Graduate Student Teaching Assistant, he teaches Music 131, History of Jazz, to 200 students in Brechemin Auditorium every morning at 10:30. He plays lead alto in the UW big band, studies with Cuong Vu and Ted Poor, and gigs around town with the other Teaching Assistants, guitarist Alex Oliverio and drummer Matt Carr. He is excited to be actively performing, composing, teaching, and studying. MacDonald, born in 1973, is a North Seattle native who rode the school bus south to Leschi Elementary as part of the Seattle School District busing solution to racial integration. In the fifth grade, he picked up the alto saxophone because of its cool looks. On the radio, MacDonald also admired the saxophone solo by Steve Gregory on George Michael's 1984 hit "Careless Whisper." At Meany Middle School, teacher Wadie Ervin switched MacDonald to baritone saxophone. Ervin's mentoring had a lasting impact. His handwritten note of encouragement on the back of a picture of Jelly Roll Morton is said to hang in MacDonald's home studio today. MacDonald attended Roosevelt High School where his mother taught Latin. In 1984, he joined the Stage Band, led by a young Scott Brown who had just replaced the retired legendary music educator Waldo King. During his high school years, MacDonald's ears perked up when saxophonist Greg Sinibaldi joined the band for a semester. It was the first time he had heard live jazz improvisation. MacDonald was in good musical company in the band. The ensemble included saxophonist Mark Taylor and trumpeter Kevin Seeley. He studied with Bruce Wilson, Don Lanphere, and Hadley Caliman, whose sound can still be heard in MacDonald's improvisation today. He attended the Bud Shank Jazz Workshop every summer and fell under the spell of saxophone virtuoso Pete Christlieb. In 1990, MacDonald had an epiphany while playing John Coltrane's "Lazy Bird" at the Lionel Hampton Jazz Festival. His soloing skills had been acknowledged and his performance was featured on the main stage. Unable to sleep on the bus back to Seattle, MacDonald realized that a life in music, unconventional as it seemed, was a possibility. While growing as a musician, MacDonald was simultaneously developing as an football athlete, tipping the scales at a muscle bound 260 pounds. The same year as the jazz festival kudos, he was named Metro League Defensive Lineman of the Year. He was fierce, fast, and focused. To stand out as a badass, he had tattoos inked on his forearm. Two doors opened for MacDonald after high school. He was accepted at Central Washington in Ellensburg to play football and won a scholarship to attend Berklee College of Music in Boston. Opting for neither, MacDonald began to ping pong around the states, pulled by a variety of impulses. Eventually, he attended Cornish College of the Arts on scholarship for a semester in 1992. 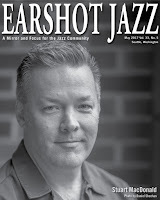 He bounced to Berklee in 1994, where he studied with Billy Pierce, George Garzone, and Joe Viola. MacDonald spent many wee hours of the night listening to jazz recordings with another Seattle saxophonist at Berklee, Marc Fendel. Migrating back to Seattle after just a year, MacDonald gigged as a sideman, recording Stretch (1998) and Jamaica (1999) with the Hi Fi Killers, What a System (1999) with Clinton Fearon, Twice as Nice (2003) with the Sharpshooters, Ahead and Behind (2004) with the Charlie Smith Circle, KPLU School of Jazz Volume 4 (2007) with the Roosevelt High School Jazz Band, and More Zero (2006) and Between Two Conclusions (2012) with More Zero (Chris Stover). MacDonald enjoyed being far from the East Coast scene. The Pacific Northwest offered more leeway to develop an original sound. "Everyone here doesn't sound like Mark Turner or Chris Potter," he said. MacDonald directed the 2nd and 3rd jazz bands back at Roosevelt High School from 2005 to 2015. He picked up some general education credits at Shoreline Community College, then transferred to UW to finish his Bachelor Degree. After graduation, MacDonald worked with pianist Eric Verlinde on the Queen of the West, a 120 passenger paddle-wheel steamship cruising the Columbia river. With his wife, daughter, and home in Seattle, MacDonald's conventional local roots continue to grow. In addition to every Wednesday at Tim's Tavern (602 N 105th St, Seattle), there are many opportunities to hear MacDonald perform in May.